First impressions on this book - it's gorgeous! The cover design is really attractive and makes you want to look inside. This fantastic design theme goes throughout ever page - just a gorgeous book! My immediate thought as I read through this is that this would be perfect as a daily family devotion to do with our children. The language is simple and clear and interesting. I love the Love Letter From God on each one - giving a personal little link to the message to the children reading this - really sweet. Also the verse could easily work into a memory verse program for homeschoolers too. The topics covered are: Creation, Adam and Eve, Noah's Ark, Joseph, Samuel, David's Anointing, David and Goliath, Daniel in the Lion's Den, Jonah, Jesus' Birth, Calling the Disciples, Feeding 5000, Calming the Storm, The Lost Sheep, Zaccheus, The Last Supper, The Crucifixion, The Ressurection, and then an invitation to join God's team at the end and the opportunity to write a letter back to God. It's a personal book and would make a great gift. 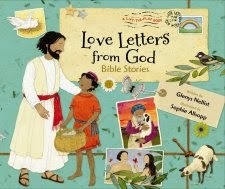 Something very precious that really helps children develop a perception of God as their Father and friend.